Despite advancement in surgical procedures, the outcomes following ACL-reconstruction continue to be poor. Less than 50% of athletes are able to regain their pre-injury level of performance. For those who returned successfully to sport, re-injury remains a risk factor. The incidence of re-injury in the first two years following reconstruction is estimated to be 6 times greater than those who didn't suffer ACL injury. This incidence is much higher in female athletes. A study reported 29.5% ACL re-injury in the second year with 20% sustaining contralateral injury. The risk of re-injury extends up to 5 years following injury. Risk factors of primary and second ACL injuries have been investigated widely in the literature. Biomechanical factors such as abnormal loading distribution patters around the knee, increased external knee abduction moment in females, side-to-side differences in lower extremities, frontal-plane displacement of the trunk and reduced lower extremity flexor activation in vertical jump have been associated with ACL injury. Deficits in Quadriceps weakness is a common persisting issue after surgery which is manifested through abnormal loading patterns in gait and sports activities.A deficit of about 20% of quadriceps strength compared to the opposite side is found in athletes after ACL reconstruction. However, even a 90% quadriceps index is not necessarily associated with normal neuromuscular control. Asymmetry in the kinematics and differences in moment arm between involved side joints compared to the other side is another factor that continues to manifest years following surgery. Abnormal movement patterns are often present bilaterally. changes in kinetics and kinematics of both knees. Studies report higher peak knee angles, moments, and joint powers relative to controls. 3-dimensional biomechanical analyses and postural stability testing reported hip rotation moment changes during landing in the uninvolved side, frontal-plane knee motion during landing, sagittal plane knee moment asymmetries at initial contact, and deficits in postural stability on the reconstructed limb. The development of compensatory strategies of the uninvolved hip is considered to be the primary predictor of risk in athletes who sustained a second ACL injury within the first year of return to play. Therefore, engaging both limbs in rehabilitation is a necessity. Gender may be a contributing factor to secondary ACL injury. Graft rupture is more likely to occur in men, according to a 15-year cohort. Another study reported no difference between sexes in graft rupture, however, contralateral injury was higher in female athletes. Young athletes are at a higher risk of re-injury and also to contralateral injury . Re-injury and the need to undergo a second ACL-reconstruction place the knee joint under devastating complications of developing OA, knee instability and difficulty in returning to sport. About 25% of athletes undergo a second revision within 6 years of the primary ACL revision. Understanding risk factors associated with re-injury is important to target all deficits in the rehabilitation program. Side-to-side Quadriceps symmetry is essential to return to sport and prevention of future re-injury. Hamstrings/Quadriceps strength ratio is another important factor to be considered in rehabilitation. The aim is to achieve at least 85% strength symmetry before returning to sport. Single-leg plyometric tests can give the clinician an overview on how the injured limb is functioning and the differences between both sides. Findings in these tests should be considered when setting up the rehabilitation plan. A study reported 38.2% re-injuries in athletes who failed return to sport criteria suffered versus 5.6% of those who passed. The same study estimates 84% reduction of knee re-injury rates in patients who passes return to sport criteria. Does timing play a role in preventing re-Injury? A study reported a significant reduction by 51% for each month return to sport was delayed until 9 months after surgery, after which no further risk reduction was observed. Delaying return to sport to 9 months gives sufficient time to recondition the athlete and train them on all sport-specific drills necessary to avoid instability and future re-injury. Pain-related fear plays a key role in distinguishing athletes who may not be able to return to pre-injury levels. Lack of confidence and fear pf re-injury are believed to influence function. For these reasons, assessment of these factors must be included in the management plan. Fear avoidance model, self-efficacy theory, stress, social support, and athletic self-identity explain inability to return to sport in athletes with full level of function and are predictive of outcomes after surgery. Motivation also plays a role when engaging an athlete into the rehabilitation plan (45% of community-level athletes discontinuing supervised rehabilitation by 3 months post ACL-reconstruction) and also to go through all stages of return to sport rehab. An athlete may feel ready and competitive before passing all stages and may discourage rehabilitation before regaining all required criteria to return to sport. Quality patient education, goal setting, frequent feedback and individualization of the rehabilitation plan are all recommended to stimulate motivation. Logerstedt et al reported that conducting the 4 hop tests 6 months after surgery is statistically significant with predicted self-reported knee function. Out of the 4 tests, the 6-m timed hop and the crossover hop tests were the best predictors. The 6-m timed hop predisposes the knee in neuromuscular control challenge and highlights asymmetries. Conducting these tests 6 months after surgery at the time before return to sport specific training gives sufficient time to address deficits that may contribute to re-injury. With the high incidence of re-injury and the evidence of poor outcomes of ACL-reconstruction revision, a need for a return to sport protocol has developed. Stage 4: Sports performance symmetry. The aim of this protocol is to recondition athletes to function optimally by targeting neuromuscular deficits to minimize rates of re-injury. Monitoring signs of overload in all stages is critical to prevent adverse effects. Improving single-limb weight-bearing function to tolerate greater knee flexion angles. Improving symmetry of lower extremity in running. 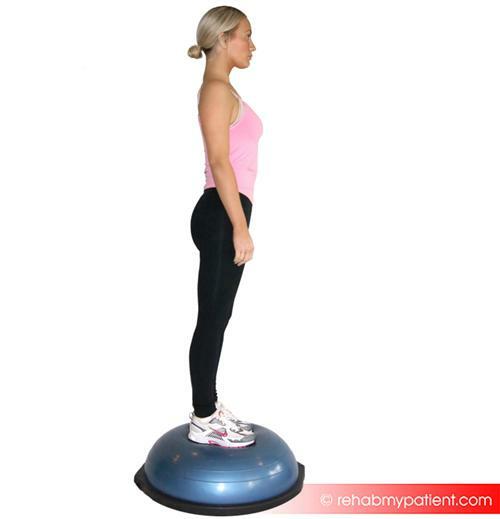 Enhancement of closed chain single-limb postural balance. A strong CORE will allow the athlete to control the deceleration of the center of mass with balanced posture and accelerate their mass rapidly by controlled force. Weakness and deficits in trunk and hip musculature are correlated with biomechanical abnormalities and ACL injuries, particularly in female athletes. Prior to CORE strengthening training, balance, proprioception and gait deviations should be well-addressed. It is important to note that an athlete may have full anatomical ROM but with functional activities, asymmetries and deficits may be present. Addressing these deficits will allow progression in speed and intensity of running without pain and re-injury. Deficits in rhythmic strides and symmetry can be detected by audible monitoring of foot contact. Pain, particularly patellofemoral pain, or ROM deficits are contributing factors to unbalanced sprinting gait. Backward gait is a way of decreasing patellofemoral pain and help the athlete to progress in this stage and may also increase quad strength. Each athlete will need individualized variations according to individual characteristics and sport. Exercise intensity should be changed constantly to challenge balance and proprioception. Modifications of body posture, switching between various unstable surfaces, speed modifications, adding a sport-specific skill and/or adding unanticipated movement can all be ways of challenging stability and balance. Increasing lower extremity non weight-bearing strength. Improving load distribution pattern over both lower extremities in activities requiring double-leg stance. Improvement of single-limb landing force attenuation strategies. With CORE strengthening and dynamic stabilization exercises continuing throughout this stage, progressive lower extremity strengthening is introduced. Gradually and frequently adding more resistance without compromising good form. At this stage, power production of lower extremity is the main aim. Additionally, athletes are trained to resist fatigue and perform plyometrics with good biomechanics. Training incorporates mid-level intensity double-limb multi-planar plyometric jumps and low-intensity single-limb hops. Provide feedback and educate the athlete to land softly with coronal plane knee control. Combining plyometrics with strength training improved jump performance and leg strength. The addition of neuromuscular training with plyometrics, CORE and speed training resulted in great outcomes in performance measures. At this stage athletes are trained to utilize safe biomechanics (increased knee flexion and decreased knee abduction angles with symmetrical forces and motions between limbs) in high-intensity plyometric exercises, produce symmetrical power between both lower extremities and learn to improve confidence to maintain dynamic knee stability with high-intensity change of direction activities. Verbal and visual feedback are important at this stage. Increased valgus angle is a factor contributing to injuries, particularly in females. Valgus loads on the knee can double during unanticipated cutting maneuvers. By teaching athletes to use movement techniques that produce low knee abduction moments during movements that can produce high loads on the joint, they can ultimately reduce the risk of injury. Evidence of deficits in muscular strength and balance exist months after surgery in both ACL-reconstructed knee and contralateral limb. Abnormal knee kinematics was found up to a year following surgery. The International Knee Documentation Committee is a great tool to assess knee function and differentiate high knee function from low knee function. Single-legged hop tests assess different measures such as performance, strength, neuromuscular control, confidence in the limb, and the ability to tolerate loads related to sports-specific activities. Specific deficits can be detected in these tests, allowing the clinician to tackle them in the rehabilitation plan and also give an idea on time to return to sport. ↑ Dunn WR, Spindler KP, Moon Consortium. Predictors of Activity Level 2 Years After Anterior Cruciate Ligament Reconstruction (ACLR) A Multicenter Orthopaedic Outcomes Network (MOON) ACLR Cohort Study. The American journal of sports medicine 2010;38(10):2040-50. ↑ 2.0 2.1 Paterno MV, Rauh MJ, Schmitt LC, Ford KR, Hewett TE. Incidence of second ACL injuries 2 years after primary ACL reconstruction and return to sport. The American journal of sports medicine 2014;42(7):1567-73. ↑ Salmon L, Russell V, Musgrove T, Pinczewski L, Refshauge K. Incidence and risk factors for graft rupture and contralateral rupture after anterior cruciate ligament reconstruction. Arthroscopy: The Journal of Arthroscopic & Related Surgery 2005;21(8):948-57. ↑ 4.0 4.1 4.2 4.3 Hewett TE1, Myer GD, Ford KR, Heidt RS Jr, Colosimo AJ, McLean SG, van den Bogert AJ, Paterno MV, Succop P. Biomechanical measures of neuromuscular control and valgus loading of the knee predict anterior cruciate ligament injury risk in female athletes: a prospective study. The American journal of sports medicine 2005;33(4):492-501. ↑ Zazulak BT, Hewett TE, Reeves NP, Goldberg B, Cholewicki J. Deficits in neuromuscular control of the trunk predict knee injury risk: prospective biomechanical-epidemiologic study. The American journal of sports medicine. 2007;35(7):1123-30. ↑ 6.0 6.1 6.2 6.3 6.4 6.5 Hewett TE, Di Stasi SL, Myer GD. Current concepts for injury prevention in athletes after anterior cruciate ligament reconstruction. The American journal of sports medicine 2013;41(1):216-24. ↑ Castanharo R, Da Luz BS, Bitar AC, D’Elia CO, Castropil W, Duarte M. Males still have limb asymmetries in multijoint movement tasks more than 2 years following anterior cruciate ligament reconstruction. Journal of Orthopaedic Science 2011;16(5):531. ↑ 8.0 8.1 Paterno MV, Schmitt LC, Ford KR, Rauh MJ, Myer GD, Huang B, Hewett TE. Biomechanical measures during landing and postural stability predict second anterior cruciate ligament injury after anterior cruciate ligament reconstruction and return to sport. The American journal of sports medicine 2010;38(10):1968-78. ↑ Leys T, Salmon L, Waller A, Linklater J, Pinczewski L. Clinical results and risk factors for reinjury 15 years after anterior cruciate ligament reconstruction: a prospective study of hamstring and patellar tendon grafts. The American journal of sports medicine 2012;40(3):595-605. ↑ Shelbourne KD, Gray T, Haro M. Incidence of subsequent injury to either knee within 5 years after anterior cruciate ligament reconstruction with patellar tendon autograft. The American journal of sports medicine 2009;37(2):246-51. ↑ Battaglia MJ, Cordasco FA, Hannafin JA, Rodeo SA, O'brien SJ, Altchek DW, Cavanaugh J, Wickiewicz TL, Warren RF. Results of revision anterior cruciate ligament surgery. The American journal of sports medicine 2007;35(12):2057-66. ↑ 12.0 12.1 12.2 Grindem H, Snyder-Mackler L, Moksnes H, Engebretsen L, Risberg MA. Simple decision rules can reduce reinjury risk by 84% after ACL reconstruction: the Delaware-Oslo ACL cohort study. Br J Sports Med 2016;50(13):804-8. ↑ Lentz TA, Zeppieri Jr G, George SZ, Tillman SM, Moser MW, Farmer KW, Chmielewski TL. Comparison of physical impairment, functional, and psychosocial measures based on fear of reinjury/lack of confidence and return-to-sport status after ACL reconstruction. The American journal of sports medicine 2015;43(2):345-53. ↑ Everhart JS, Best TM, Flanigan DC. Psychological predictors of anterior cruciate ligament reconstruction outcomes: a systematic review. Knee Surgery, Sports Traumatology, Arthroscopy 2015;23(3):752-62. ↑ Culvenor AG, Barton CJ. ACL injuries: the secret probably lies in optimising rehabilitation. Br J Sports Med 2018;52(22):1416-1418. ↑ 16.0 16.1 16.2 Logerstedt D, Grindem H, Lynch A, Eitzen I, Engebretsen L, Risberg MA, Axe MJ, Snyder-Mackler L. Single-legged hop tests as predictors of self-reported knee function after anterior cruciate ligament reconstruction: the Delaware-Oslo ACL cohort study. The American journal of sports medicine 2012;40(10):2348-56. ↑ Lentz TA, Zeppieri Jr G, Tillman SM, Indelicato PA, Moser MW, George SZ, Chmielewski TL. Return to preinjury sports participation following anterior cruciate ligament reconstruction: contributions of demographic, knee impairment, and self-report measures. Journal of orthopaedic & sports physical therapy 2012;42(11):893-901. ↑ 18.0 18.1 18.2 18.3 18.4 18.5 18.6 18.7 Myer GD, Paterno MV, Ford KR, Hewett TE. Neuromuscular training techniques to target deficits before return to sport after anterior cruciate ligament reconstruction. The Journal of Strength & Conditioning Research 2008;22(3):987-1014. ↑ Padua DA, Marshall SW, Beutler AI, DeMaio M, Boden BP, Yu B, Garrett WE. Predictors of knee valgus angle during a jump-landing task. Medicine & Science in Sports & Exercise 2005;37(5):S398. ↑ Flynn TW, Soutas-Little RW. Mechanical power and muscle action during forward and backward running. Journal of Orthopaedic & Sports Physical Therapy 1993;17(2):108-12. ↑ Flynn TW, Soutas-Little RW. Patellofemoral joint compressive forces in forward and backward running. Journal of Orthopaedic & Sports Physical Therapy 1995;21(5):277-82. ↑ Fatouros IG, Jamurtas AZ, Leontsini D, Taxildaris K, Aggelousis N, Kostopoulos N, Buckenmeyer P. Evaluation of plyometric exercise training, weight training, and their combination on vertical jumping performance and leg strength. The Journal of Strength & Conditioning Research 2000;14(4):470-6. ↑ 28.0 28.1 Barber-Westin SD, Noyes FR. Factors used to determine return to unrestricted sports activities after anterior cruciate ligament reconstruction. Arthroscopy: The Journal of Arthroscopic & Related Surgery 2011;27(12):1697-705. ↑ Deneweth JM, Bey MJ, McLean SG, Lock TR, Kolowich PA, Tashman S. Tibiofemoral joint kinematics of the anterior cruciate ligament-reconstructed knee during a single-legged hop landing. The American journal of sports medicine 2010;38(9):1820-8.